Born in Matamata, New Zealand, in 1961. He was Frank Sargeson Fellow in 1988 and was Victoria University Writer in Residence in 1995. As well as writing poetry, fiction and non-fiction, he has exhibited widely as a painter. Between 1999 and 2006 he presented a poetry segment on Kim Hill's various radio programmes. 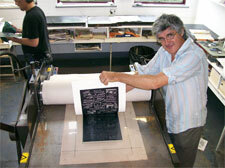 He has spoken about New Zealand poetry at numerous festivals locally and abroad. He taught in the creative writing programme at the International Institute of Modern Letters, Victoria University of Wellington, between 1997 and 2004. O’Brien is a contributing editor to the American literary annual Fulcrum. He has edited issues of Landfall, Sport and, in 2004, edited a 50 page New Zealand poetry supplement for Fulcrum (Harvard, Massachusetts). 2006 O'Brien's poems were incorporated into a fashion range by leading New Zealand clothes designer Doris De Pont. He has also worked with letterpress printers, visual artists, typographers, composers, musicians, film-makers and other artists exploring new possibilities for poetry. 2005 he was a guest writer at the Poetry International Festival, Rotterdam, and travelled to Moscow for the launching of Land of Seas, an anthology of New Zealand poetry translated into Russian. In 2008 he was a guest at ‘Les Belles Etrangeres’ festival, France, where, with Jenny Bornholdt, he read in Paris, Marseilles, Arles, Nantes and Lille. Later that month, he visited Berlin, with his partner Jenny Bornholdt, as a guest of the Goethe Institut. June 2009 he left his position as senior curator at City Gallery Wellington to work full-time on various writing and visual arts-related endeavours. August 2009 he was a featured writer at the Edinburgh Book Festival. The Imaginative Life and Times of Graham Percy curated by O'Brien, featuring the artwork of ex-pat New Zealand illustrator, designer and typographer Graham Percy (1938–2008), opened at the City Gallery Wellington, beginning a tour of this exhibition which will run until 2014. 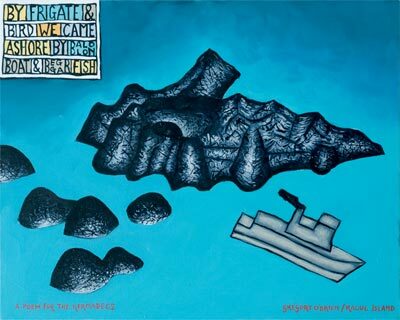 In May 2011 O'Brien was one of nine artists who travelled to the Kermadec Islands on the Navy vessel HMNZS Otago at the invitation of the Pew Environment Group. This resulted in a major exhibition which opened at the Taurauga Art Gallery then toured to the Voyager National Maritime Museum, Auckland and onto the City Gallery, Wellington. Two smaller Kermadec shows were also been held in Tonga and the Easter Islands. 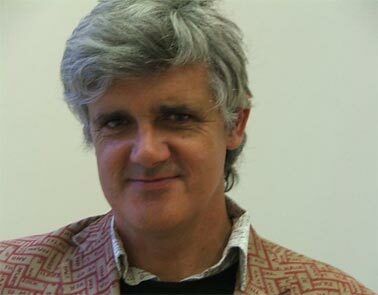 In 2012 Gregory O'Brien was the recipent of an Arts Foundation Laureate Award for his work as a poet, essayist, editor and artist and recognising "his busy and energetic presence in both arts and literature within New Zealand." In November he received a Prime Minister’s Award for Literary Achievement. In 2013 made a MNZM for services to Arts. "... a workshop model which has been developed with a degree of intuition but has been positioned under the theoretical umbrella of the educational theorist Paolo Freire who emphasises dialogue, community, informal processes and the importance of lived experience in learning. 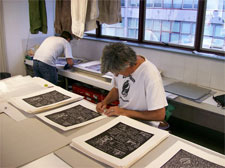 ...Cicada Press functions as a conventional editioning print workshop but our specific aims have always been educationally focused, in support of the research priorities of our invited artists. One specific and unique outcome has been the development of four Custom Printing courses so that students have a formal and measurable mechanism in which to interact with these artists in their creative process." Greg O'Brien is represented by Bowen Galleries, Wellington. For more information view the Arts Foundation site.